Two year old Emma-Lita Bourne died in hospital last August of a brain-bleed caused by a pneumonia-like illness. Coroner Brandt Shortland said it was entirely possible the condition of the house she lived in had contributed to the illness. 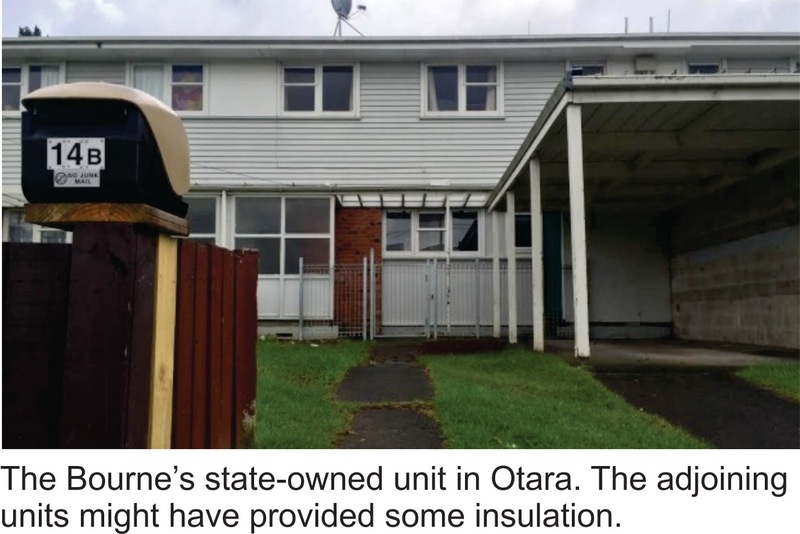 He described the housing New Zealand property where the family resided as “very cold and not getting much sunshine with no carpet and only floorboards.” The government rental agency had apparently conceded that the house was damp and cold and had provided the family with a heater. However the Bourne’s said they didn’t turn it on as they couldn’t afford the power. Green Party co-leader Metiria Turei blamed the government for an ongoing failure to make sure state housing is “decent, warm and dry and safe for our kids. In this case they claim to have put in ceiling insulation, but didn’t insulate the walls or put in carpet or thermal drapes because it was supposedly impractical.” she complained. The house was also said to be full of mould. I’ve always been a bit sceptical about the effectiveness of housing insulation. It is claimed to be a panacea to all our ills whereas I suspect it is more of a placebo. The manufacturers of these insulation products are great marketers and today their inclusion in all new homes is compulsory, but pretty well everyone in my generation were brought up in uninsulated dwellings and most lived to tell the tale. Back in those “good old days” Pink Batts were unheard of and rugby referees wore white. I was raised in a modest rough-cast house that had two bedrooms and a sunporch that got very little sun. The house was bitterly cold in the winter as rough-cast houses generally are. Most of the rooms were carpeted, but there was always a half meter of varnished floorboard around the edge of each room; wall-to-wall carpets were to be part of our future. The living areas in our house faced south and I’d always wondered why so many homes of that era were built to the south and not the sun, but a master builder recently explained to me why this was so. In those pre-refrigerator days a food safe was an essential part of the home. This was a louvered cupboard in the kitchen always placed on the south side of the house open to the elements. Instead of glass it had a fine metal gauze covering that allowed cool air in, but not insects. You stored your milk, butter, cold meat and any other perishable food items in this “safe.” Dining rooms and living rooms were always adjacent to the kitchen so it was bedrooms and bathrooms that inevitably ended up facing the sun on the north and west sides. My parents’ uninsulated house was kept warm with an open fire place in the living room - not nearly as efficient as today’s log fires - and a one bar heater in the kitchen. We went to bed with hot water bottles. Coroner Shortland would have been appalled at these conditions and Ms Turei would probably have had both my parents incarcerated. However there was no mould in the house. As soon as we left for school I gather my mother would open all the windows and the “air the house.” We did have one other fireplace; this was under the copper in the washhouse which she would light a couple of times a week to heat the water to wash our clothes. I guess with washing and ironing, cleaning, and cooking three meals a day for her family my mother wouldn’t have had much time to get cold. My wife and I had our first house built when we got married. Again, absolutely no insulation, but a few years later fibreglass batts were invented and skilfully marketed and I bought some packs home one day and placed them in the ceiling. I was disappointed that there was no discernible difference to the warmth or otherwise of our dwelling. And just like her mother and her mother-in-law before her, my wife “aired” the house daily. 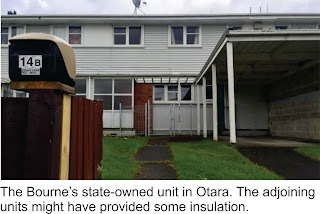 The Bourne’s state house is a two storey attached unit and I would imagine that having other units annexed each side would provide insulation on two walls of the house at least. Meanwhile a resident who lives in the same street told ONE News “The houses are damp, full of cockroaches and mice and are really cold.” A sad state of affairs, but I’m not convinced that it’s the government’s responsibility to keep houses free from cockroaches and mice. This sounds like poor housekeeping and general slovenliness. Emma-Lita’s mother looks to be of Pacific Island extraction and she and her family would no doubt feel the cold dreadfully and it would be cruel and heartless not to have a huge amount of sympathy towards them for the loss of their daughter, but did the house kill the toddler? Quite possibly, but I would lay most of the blame on poverty and culture.